The 1963-64 Bonfire Crew. Front row (L-R): Richard Lugo, Reyes Magellane, Elton Prewitt, Cosme Hinojosa. Back row (L-R): Emilio Hinojosa, Florencio Hinojosa, Salome Cantu, Carlos Guerrero, Dave Dibble, and Bill Harrison. Not shown is photographer Roy Little. Dave Dibble at Bonfire during his last visit there in 1989. Photo by Jack Skiles. Elton Prewitt exposes top of Bone Bed 2 and applies preservative to fragile bones, December, 1963. Photo probably by Dave Dibble. Lee Bement examines Intermediate Horizon hearth exposed in profile at Bonfire, 1983. Photo by Jack Skiles. The archeologists who have worked at Bonfire Shelter include some of the most influential and colorful individuals who have worked in Texas archeology. Here are highlights of the professional careers of several of the key players. The late Dr. David S. DibbleDave, as he preferred to be knowndirected the original 1963-1964 fieldwork at Bonfire Shelter. Born and raised in Utah, Dibble came to Texas specifically to work at Bonfire. He arrived in late summer in 1963 during a particularly hot, humid spell and, as he would later claim, almost decided on the spot to turn around and go back to Utah after stepping off the Greyhound bus into the oppressive midday heat of an August day in Austin. Happily, the archeological lure of the unexplored Bone Cave (as Bonfire was then known) took hold, and he spent most of the remaining years of his life in Texas. Prior to arriving in Texas, Dibble had earned his B.A. degree at the University of Utah and studied at the University of California at Berkeley. But his most critical archeological training was a five-year stint (1959-1963) as a staff archeologist on the Upper Colorado River Basin Archeological Salvage Project under famed archeologist Jessie D. Jennings. There, Dibble helped carry out survey and excavations in Glen Canyon, Utah, and the Flaming Gorge and Fontenelle Reservoir basins in Wyoming prior to their inundation. During this period he had the opportunity to take part in excavations of several major rockshelter and cave sites and developed an appreciation of both the promise and challenge of sheltered archeological sitesexcellent preservation, but deep, complex stratigraphy and difficult logistics. While at Glen Canyon, he became friends with Dee Ann Suhm (later Story) who later would help recruit Dibble for the Bonfire job. 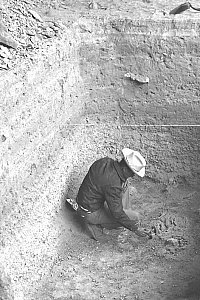 After directing the excavation of Bonfire Shelter from 1963-1964, Dibble took on the excavation of Arenosa Shelter, a spectacularly stratified site near the confluence of the Pecos and the Rio Grande rivers. This site was even more challenging than Bonfire and, in many ways, of even greater archeological importance because it contained over 12.8 meters (42 feet) of alternating layers of flood deposits and cultural layers. Most of the work has never been reported, however, as Dibble died before completing his long-planned tome. 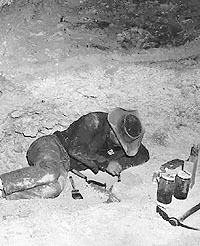 While working intermittently at Arenosa from 1965-1968, Dave supervised the work of Elton Prewitt and other archeologists at a series of sites in the Amistad Reservoir area. He took time off from 1966-1967 to do graduate work at Washington State University, eventually earning his Ph.D. in 1975 with a dissertation on the Bonfire work. 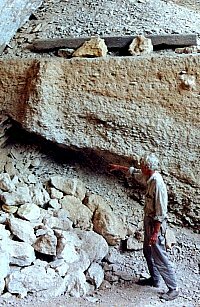 In 1970, Dibble became director of the Texas Archeological Survey, successor to the Texas Archeological Salvage Project and spent the next 15 years administering contracted research projects carried out all across Texas. Many excellent research projects and reports were generated by this work, and he gave many young archeologists the opportunity to earn a living and gain precious experience doing what they loved. When Dibble headed southwest for a final stint at Bonfire in 1983, he left the troubled world of contract archeology behind him and entered his true domain, the Lower Pecos. He was a dirt archeologist in the finest sense of the term, preferring fieldwork to almost all other things. A quiet, soft-spoken man, he was fond of saying, "The answer is in the dirt," meaning in part that, rather than speculate endlessly about what might be, he would rather dig and find out. Over the years, he learned the archeology of the region like no one before him or since, never losing the wonder of such a stunning wealth of archeological riches amid the stony heat and chiseled canyons. His unassuming ways, weather-beaten appearance, and willingness to listen and learn from old ranchers and young Mexican-American workers alike opened many gates. Dibble's professional career and life was cut short by poor health. Major surgery forced him to retire prematurely in 1984 and placed severe limits on his activities. David S. Dibble died of a heart attack in 1993 at the age of 65. But the archeological legacy he left behind continues to bear fruit. 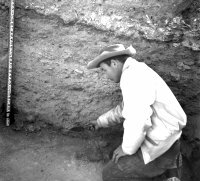 Many active archeologists in Texas and elsewhere trace back their passion for dirt archeology to field time spent with Dibble. The chronological scheme he worked out for the Lower Pecos is still in use today. 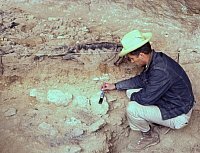 His dream of returning to Bonfire and exploring Bone Bed I and what might lie below was accomplished by Solveig Turpin and her team with Dibble serving as Principal Investigator. And perhaps someday Arenosa Shelter will finally be published and Dave Dibble's finest fieldwork will reach proper conclusion. Bonfire Shelter holds a very special place in Prewitt's heart. During the many months he worked at this spectacular but challenging archeological site, he realized that archeology was his chosen career. His "taskmaster," Dave Dibble, became his mentor and friend and he credits his on-the-job training under Dibble as being critical in his professional development. After the Bonfire project, Prewitt went on to work at a series of other sites in the Lower Pecos and throughout the state. In 1979, after working for many years at the University of Texas (where he obtained his B.A. and M.A. degrees), Prewitt struck off on his own and, with wife Kerza, formed one of the first private archeological consulting firms in the state. 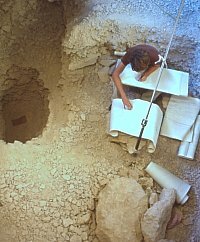 There was a growing demand for archeological consultants because of requirements of federal and state historic preservation laws such as the National Historic Preservation Act of 1966. Today Prewitt and Associates, Inc. is one of the most respected archeological firms in the south-central United States. His firm's success now allows Prewitt to spend more time in the Lower Pecos following up on archeological projects he has been waiting for decades to do. Each spring for the past five years Elton has returned to Bonfire Shelter to lead tours organized by Professor Grant Hall of Texas Tech University. Renown for his storytelling abilities, several of Elton's stories of the 1963-1964 work at Bonfire are retold in these pages. Dr. Solveig Turpin was the lead investigator of the 1983-1984 investigations at Bonfire. Turpin is well known for her work in the Lower Pecos, and she has published numerous articles, reports, and books on the rock art and archeology of the region. She received her formal training and doctorate degree at the University of Texas at Austin and served as Assistant Director of the Texas Archeological Survey (successor of TASP, the contract archeology wing of TARL) under Dave Dibble. When Dibble retired, Turpin became the Director of the Survey. 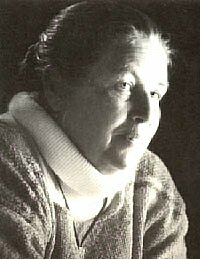 In the mid and late 1980s and continuing into the 1990s, she directed a number of projects and mentored many young archeologists like Lee Bement. During much of this time, she served as Associate Director of TARL and headed Sponsored Projects, the successor of the Survey. Like Elton Prewitt, Turpin credits Dave Dibble for her abiding interest in the Lower Pecos and adjacent areas of northern Mexico. Her projects there are considered among the most prolific and diverse. Turpin has conducted surveys, testing programs, major excavations, collection documentations, and rock art investigations. Throughout, she has consistently reported and published her work. Bonfire Shelter was the scene of Dr. Leland (Lee) Bement's 1983 introduction to cave/rockshelter archeology, faunal analysis, and Paleoindian archeology, interests that he has followed ever since. At the time, Bement was a young graduate student doing contract archeology at TARL under Solveig Turpin, his chief mentor. Bement became so fascinated with Bonfire and the mysteries of its earliest deposits that he took on the analysis of the 1983-1984 field work for his Master's thesis. Later he worked again with Turpin at several sinkholes in southwestern Texas, one of which, the Bering Sinkhole near Kerrville, he studied for his doctorial research. A thread that runs through much of Lee's career is working with bonesanimal bones as well as human remains. After earning his doctorate at UT Austin, Bement moved to Oklahoma to work with the Oklahoma Archeological Survey and teach archeology at the University of Oklahoma at Norman. There he has led research projects at several important Paleoindian sites, including the spectacular find of a painted buffalo skull atop the jumbled bones at the Cooper site, a Folsom bison kill site in northwestern Oklahoma. Today he is considered an expert on Folsom archeology and continues to live and work in Oklahoma. Dave Dibble brushes up hearth exposed in Intermediate Horizon. At his head is a partial bison skeleton in Bone Bed 3. Photo by Roy Little in 1963. Dave Dibble exposing bone in Bone Bed 1, February, 1964. Photo by Roy Little. Elton Prewitt points to Bone Bed 2 in profile. Above his head is Bone Bed 3. Photo probably taken by Roy Little in 1964. Lee Bement takes final notes at the end of the 1984 season. The small hole on the left is the pit dug in an attempt to reach rock bottom. Photo by Jack Skiles.